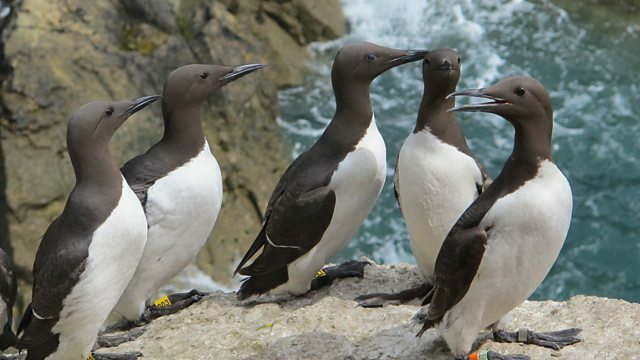 Prof Tim Birkhead reveals some of the secrets of a 42-year study by the University of Sheffield on the guillemots of Skomer Island, one of Britain's longest bird surveys. The Living World is a natural history strand that revels in rich encounter, immersion in the natural world and warm, enthusiastic story telling. Skomer Island lies off the south east coast of Wales and is home to thousands of seabirds. In the early decades of the 20th Century there were 100,000 guillemots on Skomer but numbers plummeted to just 2000 after the second world war, probably due to oil pollution in the sea. Now numbers are slowly recovering but the increase in storms may be a problem for them in the future. Professor Tim Birkhead from Sheffield University has led a 42 year study of the birds and reveals some of their secrets to Mary Colwell in this week's Living World. Professor Tim Birkhead, of the University of Sheffield’s Department of Animal and Plant Sciences, first visited Skomer Island in 1972. No one had tried to conduct a census of guillemots before and Professor Birkhead came up with an innovative way to count the birds and determine how many chicks were produced each year. By marking birds individually with colour rings Professor Birkhead was able to measure their breeding success, see how old they are when they first start to breed and see how long the birds live. When Professor Birkhead began his studies the guillemot population breeding on Skomer was just 2,000 individuals, yet pictures of the island thirty years earlier showed that there had been around 100,000 guillemots then. In 2011 the population showed signs of recovery as around 20,000 individuals were recorded.